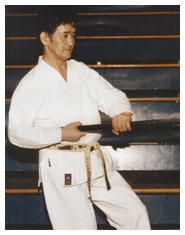 Hanshi Masaru Shintani, 10th Dan (Jūdan) was the Supreme Instructor of Wado Kai Karate in Canada and is founder of the Shintani Wado Kai Karate Federation (SWKKF). At the time of his death he was the highest ranking Sensei outside of Japan. A direct student of Master Otsuka, the founder of Wado Kai, Hanshi Shintani devoted over 50 years to the study of Karate. He also held ranks in Judo (Sandan), Aikido (Shodan), and Kendo (Shodan). 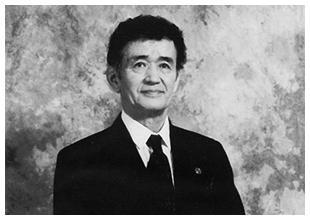 Hanshi Shintani was born February 3, 1927 in Vancouver, British Columbia, the child of Japanese immigrants. His mother was a member of the Matsumoto clan, a respected samurai clan whose history goes back hundreds of years. Like virtually all West Coast Japanese-Canadians during the Second World War, his family was uprooted and moved to the rugged interior of British Columbia for the duration of the war. The Shintani family, mother & six children, was interned in New Denver, an abandoned mining town that was used to house hundreds of Japanese Canadians. While growing up in the camp, he learned the ways of two cultures. On school mornings he attended Canadian classes in English, history, and mathematics. In the afternoon, he studied Japanese language and heritage, along with Kendo and Judo, the standard physical education for all Japanese students. After nine years under Sensei Kitigawa's direction, Hanshi Shintani was graded to sixth dan when Kitigawa returned to Japan. Hanshi Shintani himself began to travel to Japan to train in Karate and visit his mother's family. He met Master Otsuka in 1956 at a Karate seminar. Over the next few years, Hanshi Shintani competed in and eventually won the championship in the large Japan Karate Federation tournaments. In 1958, Master Otsuka approached Hanshi Shintani with an invitation to join his organization, Wado Kai. Impressed with the character and integrity of Master Otsuka, Hanshi Shintani respectfully accepted the invitation. During this time, Hanshi Shintani's family moved to Beamsville, near Hamilton, Ontario. Once there, he played semi-pro baseball and tended the family farm and greenhouse to support his family. He began teaching Karate and Judo locally as well as at the Japanese Cultural Center in Hamilton. Sadly enough, being Japanese in North America during the post-war period was to be a target of racism and violence. Hanshi Shintani credits his harsh training under Kitigawa and the humility he learned from his mother and Master Otsuka with his survival during this time: “I've learned a lesson in the war-time camps - under Kitigawa Sensei, I've protected my life, and under Otsuka Sensei I've preserved it”. In 1979, Master Otsuka graded Hanshi Shintani to hachidan (8th dan). At the same time Master Otsuka presented him with a kudan (9th dan) certificate, to be revealed by Shintani after a suitable period of time had passed (he declared his kudan rank in 1995). Also during this time, Hanshi Shintani traveled to Japan several times to train with Master Otsuka. Master Otsuka honored his Canadian disciple by visiting Ontario on a few occasions to visit and teach, the last time being in 1980, only two years prior to his passing. 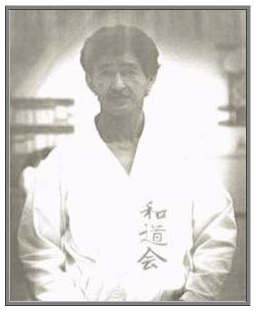 During the 1970s, Master Otsuka appointed Hanshi Shintani the Supreme Instructor of Wado Kai in North America. Some time after the death of Master Otsuka, Hanshi Shintani visited Okinawa to contact the old masters who had trained with Master Otsuka. Most of these men had passed on except for Sensei Yamashita who shared his knowledge and memories with Hanshi Shintani. Hanshi Shintani's devotion to and mastery of Karate is remarkable. Stories of his feats of skill and acts of humility confound those who have not met him. He has constantly refined and improved on the most basic of Karate techniques & concepts to advance the Way of Karate. He refused to allow the vital and dynamic nature of Karate to become stagnant and ritualized, to deteriorate into a stylized dance of impractical techniques and no longer comprise a ‘real’ martial art. He has said that there are no symbolic moves in Kata, every technique must be performed as if ‘real’. In the last years before his death, Hanshi Shintani spent much of his time developing Karate and Shindo concepts and traveled to various regions of North America and overseas to conduct seminars in Wado Kai and Shindo. As the leader of a large martial arts organization in North America, he could be a very wealthy man. Instead, Hanshi Shintani lived a humble life of quiet modesty, continuing to live by three ideals: Humility, Integrity, and Honor. Those of us in Wado Kai who had the honor of meeting Hanshi Shintani recognize what a rare treasure it is to have worked with him in both training and living the Way of Peace and Harmony. On December 2017 The Shintani Wado Kai Karate Federation Senate was pleased to announce its founder Hanshi Masaru Shintani as Jūdan (10th dan) posthumously. Hanshi Shintani has been and always will be the Grand Master and founder of the SWKKF. His students and all members of the SWKKF will forever honour and recognize his title and rank unequivocally.